I will say there is NO WAY I can cover the entire chapter as well as it deserves without my fingers falling off from all the typing. RUN, don’t walk, to get your copy of the book! It is worth every penny! First of all…who are these transitional readers? This is how Dr. Richardson defines a transitional reader. I think I was most surprised by this. 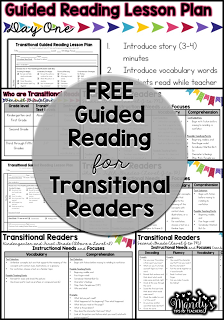 In my head, transitional readers, were just a hard a fast group determined by the reading level. It never occurred to me that the child’s grade level would impact this. 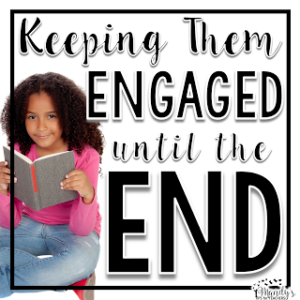 Speaking from the experience from teaching second, third, and fourth grade with readers that all fit in this group: this is dead on! 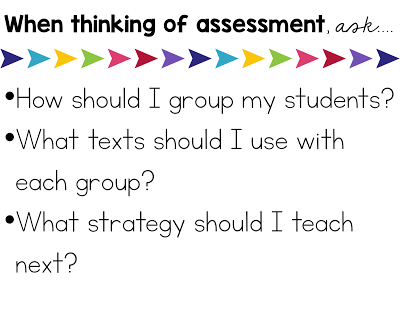 From chapter two, she suggests using a running record and a word study inventory to assess students. Then, use that data to complete this summary chart, which is available free on her website. She gives explicit directions on how to complete the chart in the book. 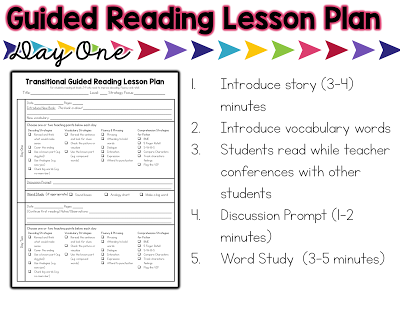 Dr. Richardson explicitly goes through a guided reading lesson plan for transitional readers with prompts and ideas for what to do with readers. She suggests a 3 day plan for books. 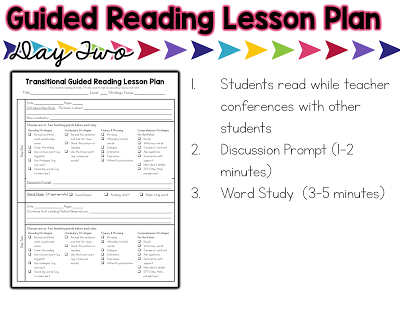 I also retyped the lesson plan she provided. The one in the book hurt my eyes! LOL There is a different version for fiction and nonfiction so look closely at the teaching points on each plan! 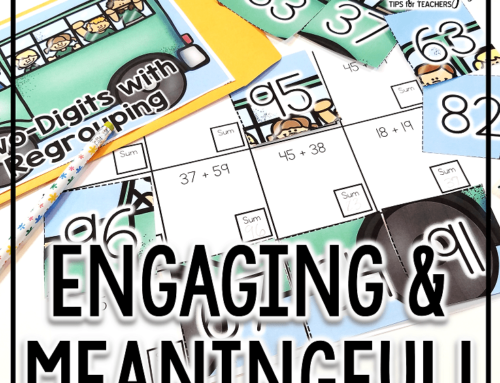 You can get a FREE copy of the lesson plan here! She suggests selecting one to two teaching points on day one and two. 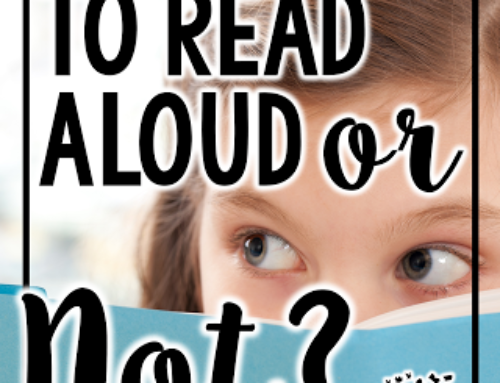 Sometimes it can be reallllly difficult to figure out teaching points for readers when you are in the middle of groups and “tapping in” on a reader. Richardson makes this SO much easier. 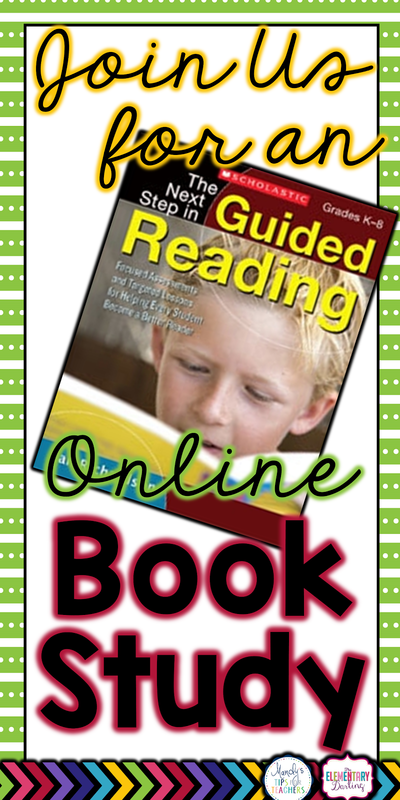 I wish I had this when I first started guided reading! I made a cheat sheet compiling all her tips for reading focuses. 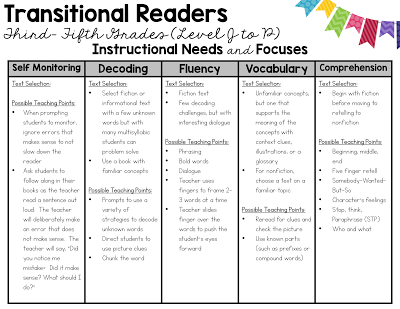 I divided the cheat sheet by student grade, since the grade level of the transitional reader can help determine a reading focus as well. 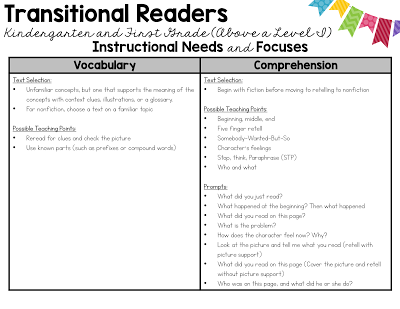 She suggested that instructional focuses for kindergarten and first graders reading above a level I should be on vocabulary and comprehension. 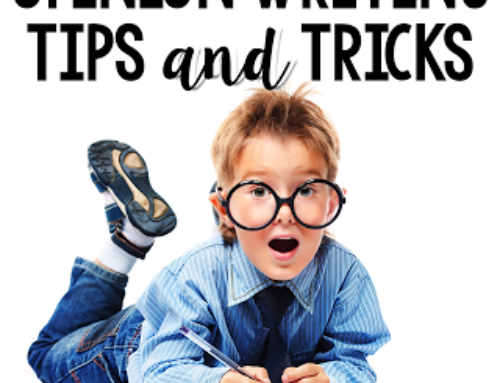 I complied her tips for text selection, possible teaching points/ instruction, and prompts you can use when a student needs help with this area. You can click on any of these images to download this file FREE! Hopefully this will help with planning groups! 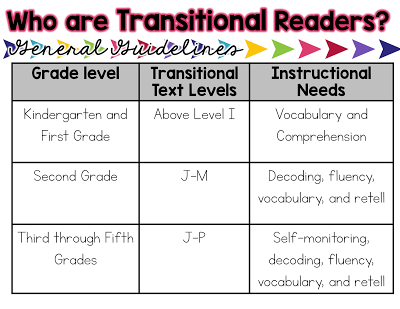 Second grades reading on a level J to M need to focus on decoding, fluency, vocabulary, and comprehension. All of her suggestions were great and detailed..and too long to fit on one page! A second page is included in the file! 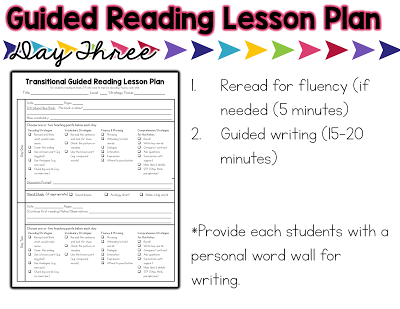 Third to fifth graders reading on a level J-P need help with self-monitoring, decoding, fluency, vocabulary and comprehension. This file is also two pages! After the reading on day one and two, students will answer and respond to a discussion question. 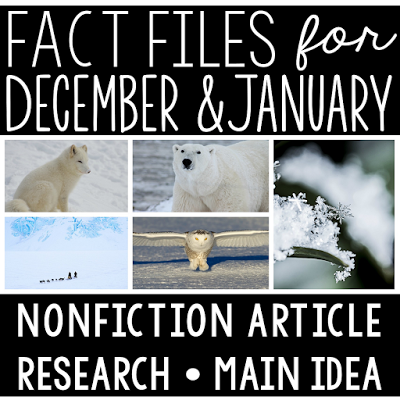 Create a question that focuses on conferencing and / or drawing conclusions. The last part of the lesson the first and second day is word study. I LOVE her plans for word study. She suggests using Sound Boxes, Analogy Charts, and Making a Big Word. There are so many resources and word lists in her book, that I am not even sure where to start. I was unfamiliar with the concept of an analogy chart, but I am IN LOVE. This is so smart. Why didn’t I ever think of this!??!! If you are not familiar with them either, check out a short 3 minute video where she models this with students. If you have the book, she even provides the lists of words to use in the charts. GAH! Day three of guided reading is a bit different. If the book is able to be read in its entirety in two days, the third day can be used for guided writing. If not, simply take 3 days to read the text and do guided writing on day four. I bolded the part about assisted writing vs assigned writing because I’m guilty of assigned writing. That was TOTAL “Aha!” moment for me! I felt like many of the guided writing activities overlapped or complement the comprehension activities and teaching points. 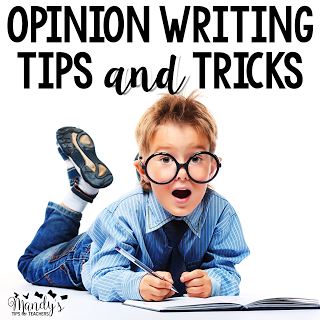 I thought this blog post at Big Time Literacy all about guided writing was FABULOUS! 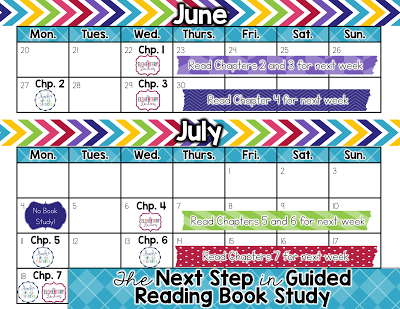 Are you ready for the rest of the book study? Here is the schedule! 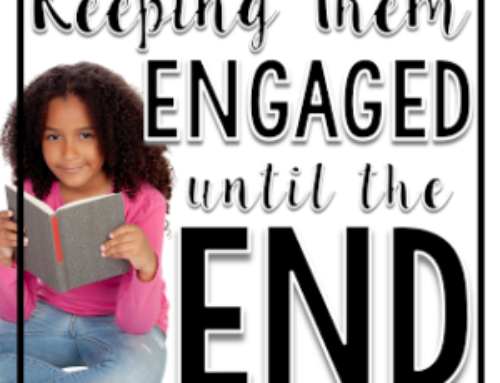 If you want to catch up, click below to see the posts about the past chapters. Use this image to pin for later, and come back here for Chapter Six! I will be at the TPT conference in Orlando, so I might be a bit late, but the post is coming! I promise! Fabulous job, Mandy! 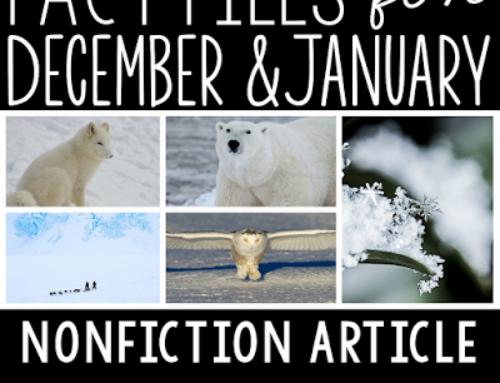 I so appreciate the free printables – they will be so helpful this coming year! Yahoo! Thank you so much, Joan! This book has been amazing! I am learning so much! Wow! I just stumbled upon this on Pinterest and feel like I found a goldmine! Thank you so much for explaining as you go, putting it in simple terms. The freebies are amazing! You ROCK! I hope you guys are enjoying this book as much as I am. I am loving how so many of these ideas that she talks about are a nice mix of some of my favorite educational ideas and researchers! I knew Dr. Richardson was obviously a bright lady, but she is also PRACTICAL about the classroom, which I adore. 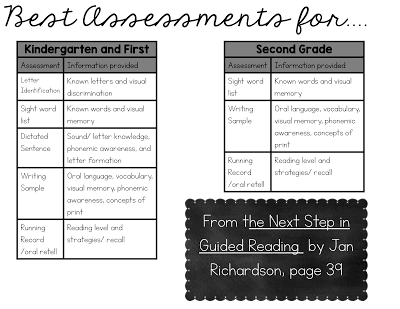 Richardson actually had a suggested list of assessments. Many of the schools that I worked in had a required list of beginning of the year assessments. I found it very interested (and validating) that many of the assessments I was required to use and the ones suggested overlapped. Your school may provide some of the following assessments. If not, I did find several appropriate and FREE assessments on Teachers Pay Teachers. 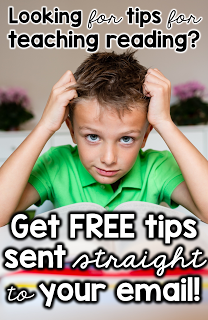 Click on the pictures to see the freebies! Purpose: Sort out any letter confusion. Strong knowledge indicates visual memory and discrimination abilities. Poor knowledge is related to experiences prior to kindergarten. 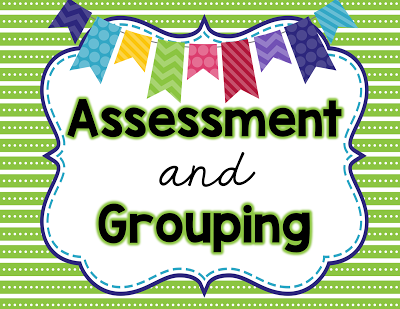 Purpose: Helpful for grouping kindergarten students mid-year and first grade students. Recognition of sight words indicates the child is strong in visual memory and should be able to read the sight words in running text. Does the child hear consonants? 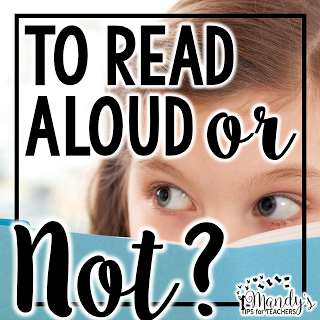 Does the child hear sounds at the beginning or end of a word? Does the student hear any vowel sounds, digraphs, blends, or endings? Purpose: Assess the child’s phonemic awareness and analyze language structure, vocabulary and concepts of print. I do not have an freebies for actual running records, because I am assuming that this is something provided b your district. 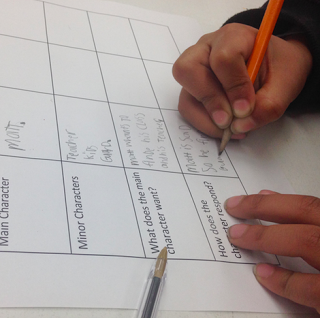 Analyze running records are essential to determine the appropriate level of text for instruction, as well as strategies and skills that need to be taught. These freebies are great to help analyze running records and also just coding and scoring running records. 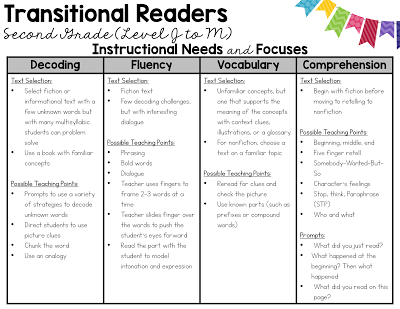 The assessments for transitional and fluent readers are a bit more streamlined. Purpose: Can pinpoint areas of instruction, especially for transitional readers. 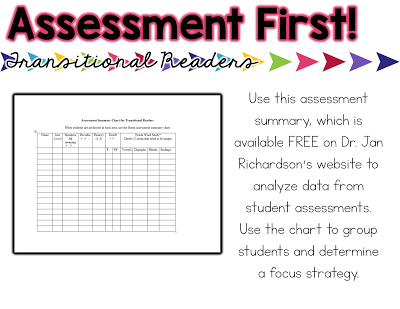 Richardson also shares her procedure from streamlining assessments for older students. Much of what she suggests is easily applied to district approved and required running records and reading assessments. She also included a FREE comprehension interview that can be copied directly from the book. It was amazing. 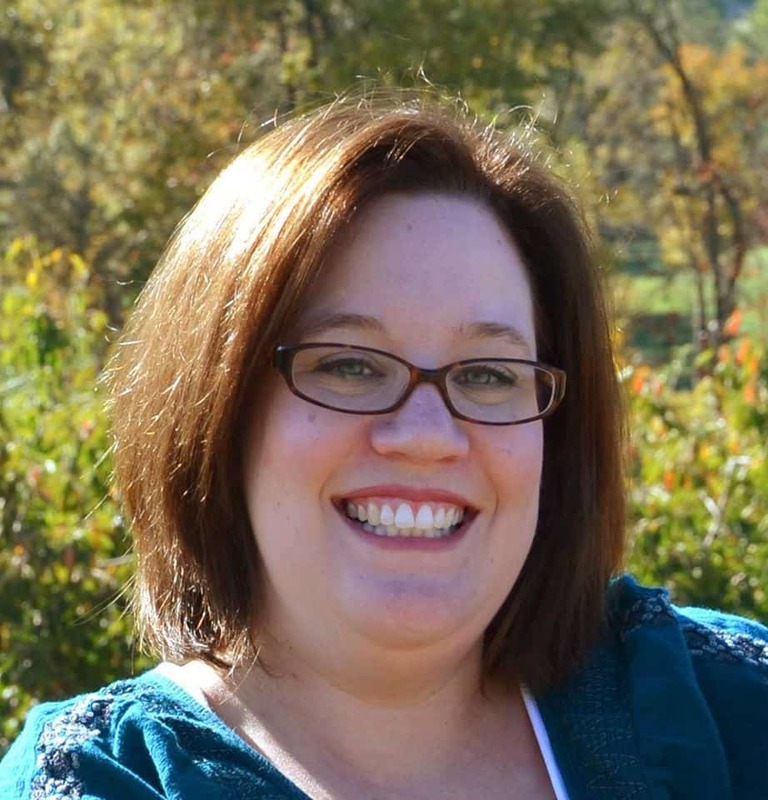 She states,” The purpose of the interview is to identify which comprehension strategies the student has internalized and which ones still need to be taught. Information from the interview is useful in grouping students for guided reading.” She also says that she doesn’t grade the interview- she just uses it as a formative assessment. Use this image to pin for later, and visit Erin on Wednesday for Chapter Three!